After seeing tri services troupe’s excellent performance Mr.Dusmantha Wijekoon handed over £1250 to tri services cultural troupe on 28th September at Manchester show. Main sponsor Sam Chandrasinghe organised a special dinner for the cultural troupe at Prince of Ceylon Restaurant in London after the London Show to show his gratitude. Mr Chandrasena also admired the performance and made individual contributions. Many others from London Birmingham & Manchester were also shown their gratitude by many ways. There I was in the high security zone, laptop, camera, voice recorder and trustworthy assistant making my way to meet the man in charge. As I approached the screening centre I began to realise exactly who I was about to meet. Many of us claim to wear the stripes of our nation but rarely do you spend time in the company of someone who does this for a living. Whilst in Sri Lanka I often find that I am mistaken for being Indian, it would be easy to be insulted but on this occasion the affection I felt from the people around me just led to a Sinhala clip with a touch of British humour. Every person that I encountered on the journey to his office was extremely polite, highly accommodating and helpful, indicative of the man himself. I realised on entering the complex that for the first time in my life I was truly vulnerable and in awe of my surroundings. In recounting this story I am shedding tears of joy and pride for a wholly extraordinary day in the life of an ordinaryindividual. We arrived at the waiting room and our greeting was especially considerate and apologetic for the lateness and security measures endured. Several minutes past and once our equipment was ready we were off to the zone. Leaving our mobile phones at the door surrounded by security personnel, the chief of staff pressed the buzzer. The Green light flickered the door opened and from behind the desk appeared a big friendly giant, General Fonseka. There was no time for admiration as it was down to business after the firm handshake. He explained my good fortune in being able to conduct an interview without the expressed consent of the Ministry of Defence. I began my line of questioning with a firm opening, where is the army today? A deep but reassuringly calm voice articulated in detail the current position concluding with the expressed desire to complete the task at hand. I found the moment this man started speaking his ability to communicate and summarise succinctly his position quite simply, inspiring. Feeling confident in my own brief I thought I should find out why he joined the army in the first place? His answer was no different to that of his fellow service men and women, a sense of duty, pride and commitment to a nation. Despite the trappings of office and his standing as the man at the top, he felt that he was like any other recruit, a solider first and figure of authority second. When he joined there was no war but unity, peace and prosperity in a country that was climbing its way to the centre stage of the world. This inner sense of humility from a man of stature was further exemplified when confronted with the welfare of his men and women. The General commented on the systems that are used daily to monitor the well being of personnel in the field and those in recovery. Admittedly, the very nature of the operation and intensity of activity implies in itself that this cannot be an exact science but diet, physical condition, emotional sanctity and contact with loved ones are just some of the things that feature on the commander’s radar. He expressed a constant willingness to go the extra mile to ensure the strength of his army. I was astounded by his dedication to this particular cause. It demonstrated for me that irrespective of serious frontline decisions this man put his people first. In doing his duty to his fellow personnel, General Fonseka also showed that his work involved much planning and focus on limiting any form of civilian casualty or fatality. It is perceived that military activity must always mean death, destruction and general carnage in an indiscriminate area. However, the commander was at pains to explain that his actions and indeed that of his troops are well targeted. Loss of life in any given conflict is an unfortunate part of reality but as and when physically possible it is avoided at all costs. Those who do decide to join the services are acutely aware of and ready to face such uncertainty. The General himself has come face to face with his own mortality on three separate occasions. When responding to his own circumstances again he drew no distinction between himself and any other soldier but did believe that because of his ranking, LTTE propaganda could present his plight far more unfavourably than that of any other soldier. Here I felt that not only was I in the company of an enormously significant figure but also someone who understood the implications of his position and the vulnerability of it. I detected a range of sentiments from the Commander, which in their entirety seemed to convey that as a person he has withstood a prolonged period of intense emotional and psychological unrest yet remained professional. Compassion is not normally a word associated with military command but the General did highlight the steps taken to rehabilitate those who were permanently injured in the line of duty. He illustrated and indentified the need for this type of work to increase. For those returning to the frontline in particular the commander himself indicated speed was everything. When recounting his injuries it appeared as if they were no more than a common cold. The commander was concerned that his priority should be to return to active duty. At this moment in time I began to wonder what the DNA of this man was as ultimately he seemed bionic in his temperament and capacity to withstand adversity. Courage is often used loosely and in many instances wrongly attributed however, the journey from the hospital bed to the frontline is an example of where the action meets the primary description. Closing on the final stages of this discussion I felt the need to ask what as Sri Lankan’s living abroad can we do to help? Our ethnic conflict is sometimes seen as an internal Tsunami with very little prospect of respite. Although, I had initially envisaged that the commander would be encouraging people to donate money to the forces purely to contribute to the high levels of expenditure. I was completely wrong and the Army Commander was more interested in engaging the community abroad in dispelling the myth that our nation is committed to war and war alone. It was then I realised the true magnanimity of the man when he did not ask us to dip into our pockets but to work together to present an accurate picture of our country but most important of all was the silent but rallying call for the good wishes and blessings from our people. By Chandila Fernando BA (Hons) Politics and Social Policy. Deshamanya Dr. Lalith Kotalawala who is visiting London on a business tour pledged to sponsor the cultural and musical show, to be held at the Troxy Theatre in London on 21st September this year, with a donation of £8,800 . This pledge was made today (18th July 2008) at a meeting with Brigadier Prasad Samarasinghe, Defence Adviser who made a presentation to Dr. Kotalawala about the ‘Api Wenuwen Api’ Project initiated by the Ministry of Defence in providing housing for serving and disabled service personnel of Sri Lankan armed forces. 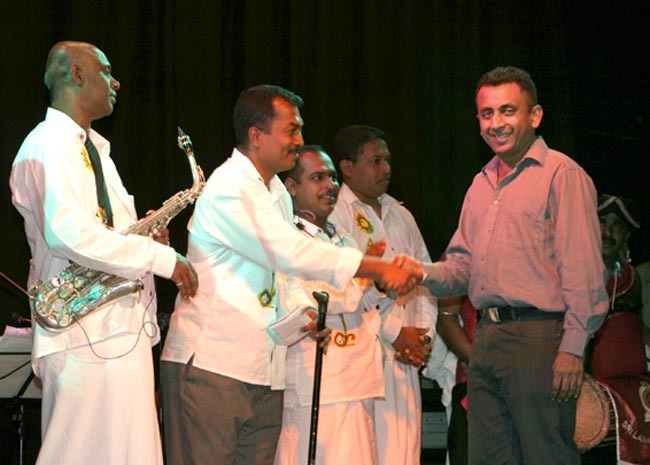 Mr Hiran de Silva and Mr David Gunawardena were also associated at this event. It was further explained that the project is supported by the Sri Lankan community and well wishers of Sri Lanka living in U.K.
Dr. Kotalawala while commending the project to provide housing to the service personnel acknowledged their contribution in protecting the territorial integrity of the Island in creating a conducive environment for all the Sri Lankans to live in peace and harmony.